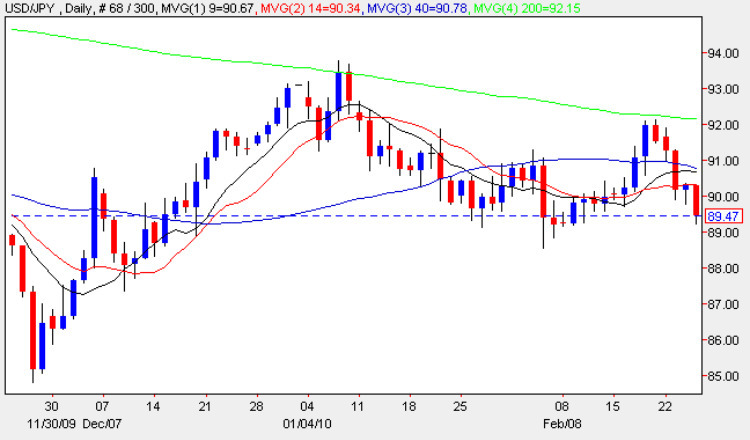 Last week’s failure by the yen to dollar pair to breach the 200 day moving average proved to be a key turning point with the pair reversing sharply lower this week and once again breaking below all four moving averages. This price action mirrors that of early January where an attempt to rally was promptly snuffed out by the 200 average. Yesterday’s close below all three short term averages reinforces this bearish sentiment which has continued in both overnight in Asia and in this morning’s early London session as we now approach the 89 price handle once again. A break and hold below this level will signal a deeper move and should we start to approach anywhere around 85 then expect to see an intervention from the BOJ as a result. Japan – is it still suffering from the equity & housing crashes of the 1990’s?